Remember how it was to see Highlander 2 or Ghostbusters 2 for the first time? The excitement, the high-expectations...the disappointment? You see, that's the worst thing about sequels to great movies, they have so much to live up to. In the case of "Child's Play IV" or Bride of Chucky, this was definitely NOT the situation. Going into this expecting a mediocre film was the best thing I could have done, because I was totally taken aback by how good it was. Seriously. This film was like entering a vegetarian restaurant and coming out with a Big Mac. It did what the other entries in the (pretty dreadful) Chucky series didn't do: it laughed at itself. I mean, let's face it, Chucky is a silly-looking, tiny, unscary DOLL. 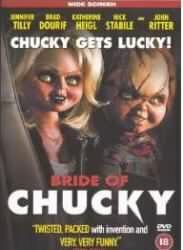 Bride of Chucky dared make fun of that, but also, it was well-written, clever, and damn funny. Jennifer Tilly delivered an impressive performance as Tiffany, Chucky's alter-ego's girlfriend (both in human and doll form), and both she and Brad Dourif were over-the-top and wonderful in their roles. I guess the real stars of this film were Kevin Yagher's awesome puppets, expressive, lifelike, and with much more personality than a half dozen supermodels. They could do it all (literally), and after a while, I just accepted them as alive. There were some poor special effects, dumb elements, and the good guys were far less likable than the villains, but that's alright. B.o.C. was a clever, funny, silly, and romantic (tell me if you don't think the two dolls were a good couple) movie much better than its predecessors. And John Ritter died a dog's death, which is always a plus. 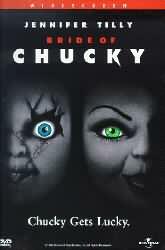 Best Scare: As I mentioned, Chucky just ain't scary, but some of his murders were spooky. I also like the way he crawled. I'd Recommend It To: A lot of people I wouldn't recommend Child's Play to. I recently re-read my original review for Bride of Chucky and realized that a) I wrote that review (which dissed the first three Child's Play movies) without having ever seen any other movie in the series and b) that I hadn't even scratched the surface of the horror film experience back in 1998 or 1999 (my memory fails me here) when Rish and I originally rented this one and sat down to watch it. Since the old review had only the original 40 Skulls attached to it, I decided it was time to revisit a movie that I remembered loving dearly. So Chucky's been out of action for 10 years, apparently stored in a garbage bag in the evidence locker of a small town police department. His girlfriend of yore, Tiffany, gets him out, stitches him back together, and tries to convince Chucky to marry her. Over-the-top violence and black humour ensues. I'm as big a fan of Brad Dourif's as anyone I know, probably bigger, but his vocal performance as Chucky never ceases to amaze me. For that matter, Jennifer Tilly is pretty annoying, but in the guise of a doll, is just about perfect. The rest of the cast is almost throw-away with the dolls taking center stage, but they are decent enough to never distract, which may have been harder than I can appreciate. That said, the script hits on all the right points and the fast pace of the gore and mayhem is only interrupted for the most disturbing love scene ever filmed. The mood and tone of the flick was pretty much dead on. The sets acceptable even when they looked low-budget. The characters were nicely done. About the only complaint I have is that the ending left a little to be desired. And even that isn't really much of a complaint. It isn't the perfect horror flick, but it is a damn good one. There may not be another flick quite as black and gory as this one that ends up being so much fun. Definitely check this one out regardless of whether you like the rest of the franchise.